The Week of Prayer for Christian Unity became one hundred years old in January 2008. This website celebrates its rich history, origins and future. It gives thanks, too, for the answers to many prayers already in the first hundred years and, as the prayer continues, hopes for the realisation of visible unity soon. Please visit the Resources page (see left) for help on keeping the Week of Prayer each year. There is no turning back on the road that leads to unity, and Christians in all the churches have become close friends and collaborators over the last hundred years. But in 2008 the Churches once again committed themselves to the complete re-integration of Christianity, in obedience to the prayer of Christ on the night before he died, "that they all may be one, as the Father and the Son are one, so that the world may believe it was You who sent me." The Centenary of the Week of Prayer was marked in London UK with a Service of Celebration and Commitment to mark the Centenary at Westminster Abbey on Friday, 18th January 2008, attended by 1200 people, and led by the Archbishop of Canterbury, the Cardinal Archbishop of Westminster, Commissioner Elizabeth Matear of the Salvation Army (who preached) and Archbishop Nathan Hovhanissian, primate of the Armenian Apostolic Church in Great Britain. A few years earlier in 2003, a service in Westminster Cathedral marked the 50th Anniversary of the death of Fr Paul Couturier and the 70th Anniversary of his refounding of the Catholic-inspired Church Unity Octave, as the Week of Prayer. Now a splendid "biography" of the Week of Prayer has been written by Professor Catherine E. Clifford of St Paul University, Ottawa, Canada: A Century of Prayer for Christian Unity, Catherine E. Clifford, Eerdmans, Grand Rapids, 2009. How did the Week of Prayer begin? In the late eighteenth century and early nineteenth centuries renewal movements in the Pentecostal and Evangelical movements of north America, Scotland and then England led to the first days of prayer for Christian Unity. Then fresh thinking in Catholic circles inspired closer contacts with Anglican and Orthodox Christians, especially in England. By the 1890s, both the Pope and the Archbishop of Canterbury were recommending the time between Ascension Day and Pentecost as a special season for prayer for unity. Above, Paul Wattson of the Friars of the Atonement, co-founder with Spencer Jones of the Church Unity Octave, writing at his desk at Graymoor NY, USA. Below, Paul Couturier, a priest from Lyon, and re-founder of the Week of Prayer for Christian Unity (painting by Brigitte Comby de Molliens, specially commissioned for the 70th anniversary in 2003). Click on the pictures for more information. The Week of Prayer as we now know it was founded in 1908 by two Anglican priests, Spencer Jones in England and Paul Wattson in the United States. Despite all the setbacks and problems to efforts in the late nineteenth century to reconcile the Catholic, Anglican and Orthodox Churches, they refused to give up hope that the whole Church could once again be seen to be one. So they committed themselves to intensified prayer for Unity. Their 'Church Unity Octave' hoped to achieve reunion between the Anglican Church and the Roman Catholic Church. Indeed, the Octave was soon adopted throughout the Catholic Church. But its focus mainly on the Roman Catholic dimension to the exclusion of other traditions meant it did not catch on widely. But in 1933 a priest from Lyon in France, Paul Couturier, understood that prayer for unity had to come from all hearts and minds. So he recast the Octave as the Week of Universal Prayer for the Unity of Christians. By the time he died in 1953, Christians in scores of countries had adopted the Week of Prayer, tens of thousands of individuals worldwide were on his mailing list for the annual leaflets, and people of many denominations, and indeed in other religions, had joined him in the universal prayer for 'the unity of humanity in the charity and peace of Christ'. With the development of the World Council of Churches, the Faith and Order movement, and the calling of the Second Vatican Council, the various strands and movements of prayer for unity began themselves to come together. So the old Church Unity Octave begun by Paul Wattson, and the 'universal' Week of Prayer designed by Paul Couturier were formally united, as were the traditions of whether to hold the season of prayer for unity in January or between Ascension and Pentecost - the choice is left to each country or region and in any case both seasons are promoted everywhere as opportunities to pray and hope for unity in Christ and in his Spirit. Nowadays the annual observance of the Week of Prayer is a joint effort between the Pontifical Council for Promoting Christian Unity at the Vatican and the World Council of Churches' Faith and Order Commission, a different region or country of the world each year choosing the theme and devising the prayers and worship. To find out more on the resources for the Week of Prayer, visit the websites of the World Council of Churches and the Pontifical Council for Promoting Christian Unity, or go to the Resources page (see left). The British and Irish version of the resources developed each year is issued by Churches Together in Britain and Ireland and available on their CTBI website. The Catholic League, an historic English society originally founded by Anglicans to urge the principle of communion with the Catholic Church as an essential ingredient for ecumenical progress and which was responsible for bringing Paul Couturier to England, also issues this Leaflet of simple prayers, based on his writings, to aid those offering daily services, as well as private devotions. The League supports and maintains this site promoting the Week of Prayer for Christian Unity. 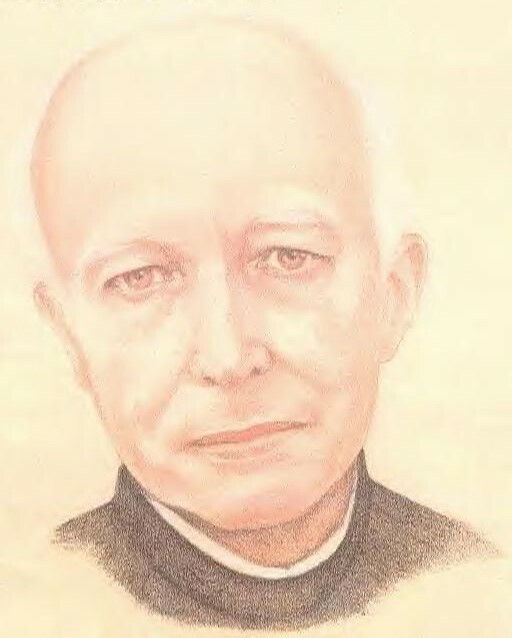 Below, Paul Couturier, a priest from Lyon, and re-founder of the Week of Prayer for Christian Unity (painting by Brigitte Comby de Molliens, specially commissioned for the 70th anniversary in 2003). Click on the pictures foSaver more information.